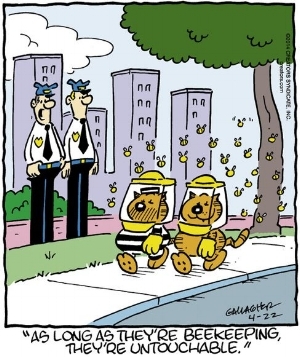 Recent Heathcliff comics are regularly indecipherably abstract and often have more than one interpretation. It's like a Rorschach test. 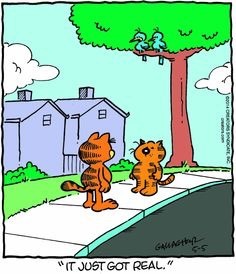 Your interpretation of a Heathcliff comic tells as much about you as it does the comic itself. There is something going on in Heathcliff comic strips that is not found anywhere else in comic strips. 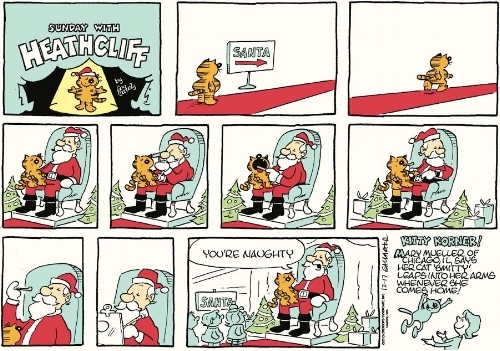 For to look at a Heathcliff comic strip is to stare into the mouth of madness. 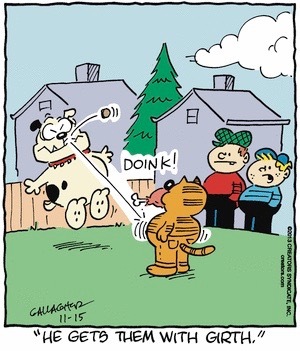 Join me, won’t you, for a few examples of Heathcliff comics. 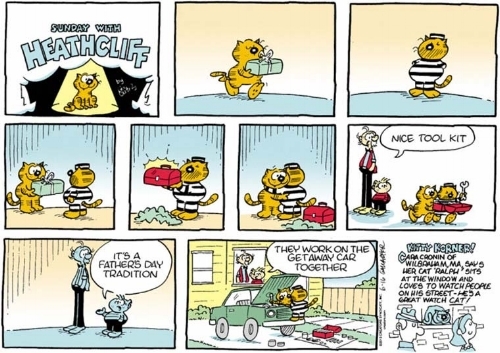 I swear that these are all real Heathcliff comics and I did not alter them in any way. Okay. So, Heathcliff likes to eat birds because he's a cat. He puts birds on sandwiches and pizzas. He doesn't seem to kill them before trying to eat them, though, so they often fly away from him. That's why the sandwich had wings and that's why this pizza box has wings. Heathcliff's father, Pops, is a convict. He always is wearing a striped prison outfit when he appears. I'm assuming he is locked up, but gets supervised day trips to see his son. Heathcliff is a street cat, who grew up hard, and this is the only life he knows. There's a lot going on here. The first and most obvious is that Heathcliff and Santa Claus seem to have some long-standing beef. The second thing is that Santa Claus is working in the "Complaints" department of a shopping mall. I don't know if this is supposed to be the real Santa Claus or just a mall Santa. Maybe this is where Heathcliff and Santa's beef started. Heathcliff is a tattooed badass who doesn't play by the rules and he doesn't care if Santa doesn't like it. This is a very invasive but thorough mall Santa. Heathcliff's universe has a lot of guest stars. In this one, Smokey the Bear and Heathcliff are just hanging out talking about skinny jeans. Heathcliff is big into jeans. Jeans and helmets are two big parts of Heathcliff's fashion. 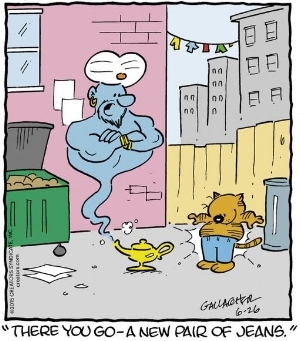 A genie granted his wish for jeans. Heathcliff has made the mice in the Nutmeg house wear jeans, and Grandpa Nutmeg is sick of it. I don't know. There's no way to take this other than this plumber has fucked Heathcliff. A lower back tattoo, or "tramp stamp" for you readers that aren't as woke and sensitive as I am, is a symbol in American culture of promiscuity. I suppose the plumber could just be a big fan of Heathcliff, but then why would the bird say that it's "too much information"? If you hired a plumber and they happened to have a tattoo of a neighborhood cat, and then your bird said to you, "too much information", you would know what the deal was. Heathcliff fucked this plumber. End of story.